The sight of a badly self-plucked parrot with its owner hoping for some ‘cure’ is all too frequent. Sometimes the bird has removed 90% of its own feathers and may even be self-mutilating its flesh. We might ask why such a sight is so common in parrot-like birds. It is of course as easy to acquire these ‘exotic’ animals as it is to acquire a domesticated pet such as a hamster, rat or a goldfish. Buyers are simply required to be over 16 years old. Most of the needs of species such as small domesticated rodents can be met while these animals are kept as pets. The provision of their needs is not particularly demanding for the animals’ keeper, compared with the effort required for most exotic animals. Nor are most other ‘pets’ particularly long-lived. Conversely, the medium-sized and larger parrots have complex needs and a lifespan similar to humans (Low 1992). However, it is as easy to acquire a parrot as it is any other commonly-available (but domesticated) species. The ease of acquisition bears no relationship to the knowledge required in order to keep the bird well. This is perhaps at the heart of the matter when we look at the quality of care many parrots receive as companion animals. While the condition of the plumage of wild parrots varies and these birds may sometimes damage each others’ feathers no one has ever seen self-harming in wild parrots; the behaviour is confined to captive birds. Here, the condition seems more common in lone (caged) companion birds as opposed to aviary birds which have the company of their own kind. Since there may well be dietary and medical issues which contribute to self-harming in parrots, these aspects should always be investigated when presented with a bird in this condition. However, self-harming always includes a behavioural component since the bird is making a voluntary decision to damage its own body, so this aspect needs to be examined as well. We know that where an animal’s behavioural needs are frustrated, then the animal is vulnerable to behavioural problems. 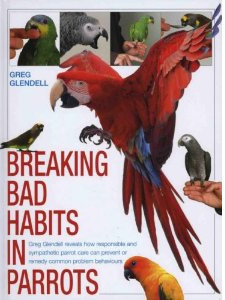 Engebretson (2006) writes: “The freedom to express normal behaviour and the freedom from distress appear to be inextricably linked in captive parrots and other birds kept as pets.” While we do not have many detailed studies of the behavioural ecology of many species of wild parrots (but see Diamond and Bond, 1999 and Rowley 1990) we do know that they are highly social animals which typically spend most of the day-time engaged in foraging for a range of foods, flying many miles each day, and engaging in regular sessions of mutual preening (Birchall 1990). While some aviculturists allow some of their breeding pairs to raise their own young, many parrots are hand-reared. Even before the end of the commercial importation of wild-caught birds into the European Union in 2007, most captive-bred parrots destined for the pet trade were being hand-reared. The hand-rearing process may start with removal of eggs, which are incubated artificially. The reasons for hand-rearing are essentially commercial. Where eggs are removed from a laying female, she is stimulated to re-lay her ‘lost’ clutch, so more eggs can be had from her each year than is natural. As a result of being fed exclusively by humans as neonates, these hand-reared parrots imprint onto humans. As immature birds they will show submissive behaviours towards humans. This trait continues, at least until the birds reach sexual maturity at 2 to 5 years old (depending on the species). The submissive behaviours ensure the birds are tractable and can be handled by potential buyers. ‘Cuddle-tame’ parrots sell much quicker in the pet shops than those which are not so tame. Later, these birds generally become sexually imprinted onto humans. For the owner, this manifests as the birds exhibiting courtship behaviours; regurgitating food onto them and attempting to mate with them, usually on their hand. For third parties, the effect of this mal-imprinting can result in the bird becoming aggressive to other family members, or other pets or even inanimate objects which might ‘threaten’ the bird’s relationship with its owner. 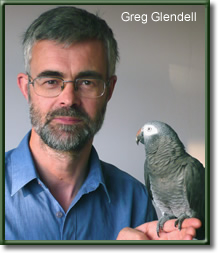 The adverse effects on the behaviour of African grey parrots when they mature were studied by Schmid, et.al. 2005. Indeed, many behavioural problems do not manifest until the birds become young adults. Typically, problems include over-bonding to one member of the household and aggressive biting of anyone who approaches the bird’s favoured person. The bird’s normal contact calls often escalate into distress calls whenever the favoured person leaves the room, so the bird becomes a ‘screamer’ or noise nuisance. These sexually mal-imprinted birds experience behavioural frustrations with which they fail to cope. Other frustrations may manifest as stereotypies and self-harming of feathers. So hand-rearing, or what we might more accurately call parental deprivation, sets in place a behavioural time-bomb with a 2 to 5 year delay in behavioural problems. Indeed, according to Schmid, et al. the maladaptive behaviours of hand-reared birds appears to be largely in proportion to the amount of parental deprivation they have experienced. Where grey parrots are part-parent raised (not removed from the nest until at least 8 weeks old) they suffer fewer behavioural problems as adults than those which have been solely hand-reared from the day of hatching. In addition to adverse behavioural issues caused by hand-rearing, there can be adverse physical effects due to handling of neonates by humans, including osteodystrophy (Harcourt-Brown, 2003, 2004). Birds use their ability to fly in order to escape from many fearful situations. While this escape response is the bird’s most essential predator-avoidance mechanism, it is also used to avoid a range of other adverse encounters. However, parrots, even immature birds, are often subjected to wing-clipping. Clipped birds will still execute this fear-induced escape-by-flight behaviour since the initiation of it is a reflex action. The bird cannot ‘control’ a reflex response. Such birds are then at risk of crash-landing and injuring themselves. So, an already fearful situation is exacerbated by the bird’s often painful crash-landings. Such events would not be repeated in a wild bird, since any flightless wild bird would soon be dead. These events can trigger so-called ‘phobic’ behaviours in captive parrots. Phobic birds display an apparently exaggerated fear in response to ‘harmless’ situations (Luescher, 2006). In the author’s experience, many phobic birds are already flight impaired; due either to being wing-clipped or self-mutilation. Since these birds cannot employ their escape reaction, their ‘phobia’ is likely to be reinforced each time they try to avoid some fearful event. If they do not ‘escape’ the problem because they cannot, and also hurt themselves when crash-landing, then pain and fear become more frequent and unavoidable events for them. Where phobic birds have flight restored (by imping or removal of feather stumps to initiate immediate feather re-growth) their confidence improves and their fearful reactions tend to subside. As clipped birds risk breaking their growing blood feathers, imping also offers good protection while these feathers grow back. Non wing-clipped companion birds can of course easily be taught several requests to fly to and from their keepers and this obviates the ‘need’ for wing-clipping. Were dogs and cats to be confined to small cages and only let out for an hour or two each day, we would not be surprised to see more incidences of ‘behavioural’ problems in these animals. Captive birds are, by default often confined to cages for most of their lives. For parrots, over-use of small cages which may also be bereft of environmental stimulation, commonly leads to stereotypical behaviours, particularly route-tracing and self-plucking (Meehan, Garner and Mench 2003). However, where birds have many hours each day out of their cages and are provided with a stimulating environment which includes facilities to forage for some foods they are far less likely to suffer behavioural problems. Without direct, physical contact with their keepers or other birds (preferably conspecifics) the caged bird is, essentially in solitary confinement. Where the bird’s carer can be persuaded to provide the bird with a more stimulating general environment which includes several hours out of the cage each day, facilities for foraging for some food, flying opportunities and the company of other parrot-like birds, then the bird’s general behavioural frustrations will be greatly reduced. However, some unwanted behaviours such as biting and self-plucking may still occur in some birds. Changing these behaviours will require a more focussed, scientific approach from the bird’s keeper. In the author’s view, the most effective means of reducing and even eliminating unwanted behaviours is to use methods grounded in applied behaviour analysis (ABA). The use of ABA for modifying some parrot behaviours has been advocated for some years by Dr Susan Friedman (see www.behaviorworks.org) in the USA. The efficacy and suitability of ABA lies in requiring the carer to first ensure the bird is provided with incentives to motivate it to carry out the behaviours being requested. So, ABA relies on positive reinforcement (rewards) for desired behaviours while eschewing any aversive interactions with birds such as punishment, admonishment or negative reinforcement. The rewards used are determined essentially, by the particular bird. Some respond very well to food rewards, other will ‘work’ for a head-scratch or access to a favourite toy (Glendell 2007). Where unwanted behaviours occur, a non-antagonistic approach is maintained. Birds are not reprimanded or ‘challenged’ for any unwanted behaviour. The concept of ‘dominating’ a bird and forcing it to be compliant is rejected on welfare grounds. A parrot’s need for companionship and company can be used to ask it to refrain from unwanted behaviours. So, instead of returning a ‘bad’ bird to its cage in response to some unwanted behaviour, the carer calmly removes themselves from the company of the bird for a few minutes by walking out of the room. Once a bird understands the connection between an unwanted behaviour and its favoured person leaving it, it has an incentive to cease the behaviour. It remains a glaring omission that almost all animal welfare care staff have no scientifically-based training in understanding the behavioural repertoire (the ethology) of the species they care for. Nor do staff usually have any scientifically-based understanding of benign behaviour modification techniques (use of ABA, as above.) However, without this knowledge, many well-meaning interactions between welfare staff and the animals they care for can result in further unnecessary stresses on the animals. The clothes people wear, the speed of their actions, the way they look at (stare at) birds, the type of containers they use to transport them in, the volume and pitch of human voices, all background sounds the birds might hear, all these things have a great bearing on the degree of stress the birds may be subjected to. These aspects are heightened particularly when animals are being confiscated by enforcement officers or rehomed to any different location. Sadly the cognitive abilities of birds generally goes unrecognised by those whose main work is related to mammals. All animal welfare bodies should carry out a thorough review of their staff training programmes to ensure staff have a reasonable understanding of the scientific principles of animal behaviour before allowing staff to interact with any animal. In order to make real progress in the care of companion parrots, many ‘traditional’ avicultural practices need to be dispensed with. Many species clearly are not suitable to be kept as ‘pets’ at all. A cessation of hand-rearing -simply letting parrots raise their own progeny- will certainly help. Training companion birds to accept some simple flight requests from their keepers removes the ‘need’ for wing-clipping and most birds learn these requests within a few days. Ensuring owners are fully aware of the need for birds to be out of their cages for many hours each day is also vital. Of course all of this first requires people to change their behaviour, and that is always the really difficult task for vets and behaviourists alike. Birchall 1990. Who’s a clever parrot then? New Scientist Feb. 24th 1990. Diamond J and Bond A: Kea: Bird of Paradox Univ. California Press 1999. Rowley, I: The Galah. Surrey, Beatty and Sons, 1990.